I went back in time to my A Level art days remembering how I used to love all things Andy Warhol especially his Marilyn Monroe artwork and decided to give the Lotus Blossom the same treatment! I think I even impressed my hubby too - when I told him yesterday that I was going to do a Pop Art card with Stampin' Up stamps he sort of snorted and replies 'good luck with that one' - how rude! He had to eat his words when he saw my card!! I think your hubby is taking back that *snort* ... I adore everything about this design ... you captured his style perfectly ... just fabulous! That card is so Andy Warhol - brilliant and it seems your husband was wrong!! 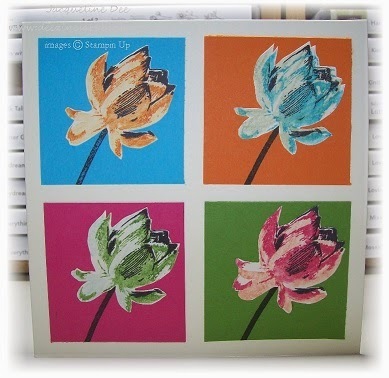 Beautiful pop art card Jacquelineand the flowers look gorgeous. Love your tree panel card above too - stunning! This card is fantastic!!! I love the colors and the Andy Warhol treatment - wow!!! Clever! I recognised the take on Warhol immediately and it looks great! Want Free Stampin' Up Stuff?? Design copyright 2018 MHKDesigns. Simple theme. Theme images by enjoynz. Powered by Blogger.